Vegetables, antioxidants, fiber – these are all good things, right? Sure, unless they are actually just your cabbage-variety junk food masquerading as healthful food substances. With gazillions of products on store shelves vying for your attention, don’t think that food and beverage manufacturers are unaware that consumers look for these buzz words, along with pictures of fruits and veggies on packaging. And they’re especially tuned into the guilty feeling that comes with snacking on less than stellar foods — guilt they make no bones about taking advantage of. Below are six examples of these fraudulent products, followed by some tips on healthy substitutes you can choose so you won’t fall prey to this snack-food scam. Yes, it is made with some sweet potatoes, but this chip (or cracker, if you choose) is mostly made from corn. It’s essentially a corn chip, which is fine if that’s what you’re looking for. But don’t get misled by the sweet potato come-on. Home-made sweet potato chips are quite easy to make. The hardest part is cutting the sweet potato which you can make much easier by using a mandoline-type cutter. The rest is as easy as opening this bag of corn chips in disguise. Instead of the slick photo of veggies taking up a good top half of this bag, here’s what would be depicted if Herr’s accurately represented its contents: a bag of potato flour and potato starch, a bottle of canola oil, some “natural” flavors, more oil, and, finally – some tomato paste and spinach powder. Considering that one little ounce of ‘real’ spinach will give you 56 percent of your daily allowance of vitamin A, 14 percent of your C and 5 percent of your iron, this bag of corn flour chips contains zero of those nutrients, so whatever amount of paste and powder are in them doesn’t amount to much of anything. Nice!, the new-ish Walgreens store brand has put a lot of thought into the package design of these potato-flour thingies they call “veggie sticks.” Front and center is a “pot” labeled “spinach” with the “veggie” sticks in them bearing a sign that says “eat your greens.” Maybe they mean the color green, as the small amount of spinach powder these contain doesn’t amount to a hill of, well, spinach. If you just went by the front of this box you may think this product contains everything you need for health and happiness; fiber, antioxidants, coconut and fudge. With just one bar providing 35 percent of your daily fiber “value,” it sounds like a heck of a deal. But the fiber in these Kellogg’s chewy bars isn’t from whole grains, but rather from chicory root fiber, an additive that food manufacturers love, since it adds loads of fiber to foods, is slightly sweet and mixes well with other ingredients without adding a strong flavor. Unfortunately, one big problem with chicory root fiber is that individuals can differ greatly in just how much they can tolerate without suffering from gas, bloating, nausea and flatulence. Even small amounts can set some folks rumbling. So considering what Kellogg’s is packing these bars with, perhaps you’d be better off not to try them for the first time on your way to that big job interview. But it’s not the turbulent chicory root fiber that puts these bars in the “fake” category. It’s the rest of the ingredients, which include high fructose corn syrup, artificial flavors, artificial colors and partially hydrogenated oil – making this a healthy snack not. I don’t care how many antioxidants they pump this with — it’s still soda! And a soda with high fructose corn syrup as the second ingredient and two preservatives to boot. If it’s green tea you’re looking for there are numerous high quality ready-made brands (such as Honest Tea with honey) to choose from, or you can make your own with boiling water and some tea! I know it sounds crazy, but folks have been brewing tea like that for centuries, I’ll bet you can probably do it, too. The folks that designed the Garden Veggie Straws package must have had a moment of truth about this product. A small moment, perhaps, recorded in very small type way down on the bottom of the package, which refers to it as “potato snack.” But that, of course, is eclipsed by the super-gigantic “veggie” name and basket of vegetables graphic. Are you really hankering for a healthy snack? Veggies– the real thing: If it’s vegetables you want to snack on, then make it vegetables, not potato-flour chips! Carrots, peppers, celery – all these veggies travel quite well and can be easily prepped at home for any snack bag. Organic corn and potato chips: At those times when only a chip will do, the organic section of your supermarket is a much better place to look, with plenty of varieties to select from. Nuts: Cashews, pistachios and almonds are now widely regarded as “health foods.” Watch out, however, for ones with flavor-enhancing additives. (Actually, nuts taste great with nothing added other than, perhaps, a bit of sea salt). Fruits: Apples, bananas and oranges look as if nature designed them just for taking on the road with you. Homemade goodies: Do you make your own popcorn, cookies, bars or fruit mixes from healthy or organic ingredients? Then make an extra batch to take along with you, and you’ll avoid becoming a hungry ‘hostage of the highway’, buying cheap chips and fake veggie products from convenience stores and rest areas vending machines. So just how much high fructose corn syrup are you consuming, anyway? If you regularly dine out or eat processed foods, the chances are high you’re taking in more than you might have ever imagined. Back in the 1980s, when HFCS was a fairly new food ingredient, it was being touted as “better use of an abundant homegrown crop” in a trade publication ad for Cargill headlined “How the newest ingredient in soda pop helps sweeten the pot for corn growers.” As the ad explained it, a $90 million expansion of the company’s facilities would, when completed, give it “a total capacity of 1.3 billion gallons of fructose a year … enough to fill a trainload that would stretch 154 miles.” Which is an awful lot of fructose – the very component that the Corn Refiners Association (CRA) has more recently tried to downplay in advertising claiming that HFCS is not really all that high in fructose after all. But all that extra capacity has apparently been put to use, judging from the way HFCS has morphed way beyond “soda pop” into every conceivable food product that can be made. An example of just how much HFCS is being produced these days comes directly from the CRA itself, which noted in the most recent “Corn Annual” report that total shipments for HFCS for 2011 came to more than 19 billion pounds of the stuff. Back when that ad ran, in 1982, USDA numbers for “deliveries” of HFCS only amounted to 26.6 pounds per person each year. But that number has been insidiously rising year after year as this test-tube sweetener has found its way into every kind of food, hitting the 60-pound-per-person mark in 1997 (interestingly, sugar intake has actually declined over the last century according to U.S. Department of Agriculture figures). Our petition requests that the FDA take action to protect the public from the illegal, mislabeled use of high fructose corn syrup. So exactly how much HFCS do these various foods contain? Unless you’re privy to “proprietary” information, as it’s called in the industry, you really have no way of knowing. That’s also true of the actual fructose amount in whatever HFCS “blend” a manufacturer may be using. These unknown fructose concentrations are the subject of a current petition filed with the Food and Drug Administration by Citizens for Health, asking that the agency take action against food and beverage manufacturers using HFCS with fructose amount above 55 percent, the highest amount the FDA allows (Read more about the issue here). What we do know for sure is that HFCS turns up in some very unexpected places, such as the products below. Progresso Bread Crumbs (Plain): The package says the these bread crumbs will “inspire your passion for the art of cooking…” with “authentic Italian taste,” but you’d be hard pressed to find an “authentic” Italian dish that called for high fructose corn syrup. Sunsweet Prunes: Referred to on the label as “the American Super Fruit,” there is no doubt that prunes are a healthy as well as a sweet-tasting natural product – and one you would least suspect would harbor an unnatural sweetener like HFCS. French’s Flavor Infuser 10 Minute Marinade: High fructose corn syrup takes the honor of being the very first ingredient in this concoction, even before water and tomato paste. Kraft Catalina Anything Dressing: With the claim that it’s “fat free” appearing on four places on the packaging, this product is apparently intended to be used on more than salad, as the name implies. It also has HFCS is listed as its second ingredient, right after tomato paste. Kraft Miracle Whip: Kraft calls this popular dressing a “secret blend,” but if you read the label you’ll find that it includes HFCS. Vlasic Bread & Butter Pickles: HFCS is the second ingredient, right after cucumbers – demonstrating how easy it is to make a sandwich with HFCS in every single ingredient and not even realize it! Mott’s Original Applesauce: Here’s yet another supposedly good-for-you-food bearing a major brand name that’s been adulterated with this cheap and unnatural sweetener. Fortunately, organic unsweetened applesauce is easy to find and just about the same price. Krusteaz Cranberry Orange Supreme Muffin Mix: How “supreme” could the muffins made from this mix be with HFCS in them? Heinz 57 Sauce: While the label asserts it will “add zest to steak, chicken & pork,” a glance at the fine print says it will also add HFCS, which is the second ingredient in this sauce after tomato paste. Campbell’s Healthy Request Vegetable Soup: Also masquerading as a “healthy” product while containing high fructose corn syrup is this new version of an old standard recipe, whose label claims that’s it’s “M’m! M’m! good…for your heart.” But a study, done at that University of California at Davis, found that adults who consumed HFCS for two weeks as 25 percent of their daily calorie requirement had increased blood levels of cholesterol and triglycerides, indicators of increased risk for heart disease. And in 2011, researchers at Georgia Health Sciences University concluded that high fructose consumption by teens can put them at risk for heart disease and diabetes. The upshot is that despite industry claims that high fructose corn syrup is fine “in moderation,” the fact that so many diverse types of popular food products have been spiked with it makes consuming “moderate” amounts highly unlikely – unless you’re in the habit of carefully scrutinizing the ingredients of every processed food you buy (or of purchasing organic products). Not to mention that there may well be even higher levels of fructose in many of those items than you’ve been led to believe. You might even say there’s a whole trainload of it just waiting for you in the supermarket. Just what are “happy calories”? If you have no idea, Coca-Cola is only to glad to fill you in on the principle of caloric contentment. The world’s largest beverage company wants you to know that the excess calories you gain from guzzling its flagship product Coke are really your friends, ready to be spent on “extra happy activities” such as dog walking, laughing and dancing. By bringing a familiar “calories in, calories out” message to consumers (one Corn Refiners Association President Audrae Erickson has been fond of conveying in her appearances over the last few years), the soft-drink giant has been doing its part to spread the word that that “…all calories count, no matter where they come from, including Coca-Cola.,” but can be easily worked off through all kinds of recreational pastimes. Of course, there are scores of consumers and health professionals who would call those calories in Coke, which come from high fructose corn syrup, distinctly ‘unhappy’ ones that may ‘count’ in ways we hadn’t counted on. In fact, if you look at “delivery” data from the U.S. Department of Agriculture (USDA), it wasn’t until 1968 that HFCS first appeared as a little blip on the data chart, coming in at 0.1 pounds consumed per person annually. By 1978 we were sucking in 10.8 pounds per person per year, and it was all uphill (or downhill) from there, hitting an annual high in 2002 of 62.9 pounds of HFCS consumption per capita. By contrast, our sugar intake has actually declined over the last 100 years, with folks in 1909 consuming over 73 pounds per person annually, rising to 101 pounds by 1969, only to drop almost 40 pounds per person by 2011 with the corresponding rise in HFCS use. And if you’ve ever wondered how much actual HFCS might be in that soda, we’ve actually gone to the trouble of measuring out the amount of this test-tube sweetener that can be found in various ‘syrupy’ drinks (which, as we’re pointed out before, are not “sugary drinks” in spite of how many times you see them mistakenly described as such). The results are shown below. The point is that while sugar may be sugar, it is not high fructose corn syrup (as was made clear last year by the Food and Drug Administration) – and just as a teaspoon of high fructose corn syrup is not the same thing as “a spoonful of sugar” (or a sugar cube), neither can the calories found in these two very different sweeteners be said to affect us the same way, in the opinion of many experts. So while it may once have been fairly easy to “work (or play) off” the calories in a truly “sugary drink” and “be OK,” it may not be quite so simple with one whose caloric content comes from HFCS. Perhaps someone ought to tell the folks who market Coke. April 23, 2013 – We rely on our government to keep us safe. Whether it’s the threat of violence or unsafe products, most believe that our government will watch out for us and protect us. So why is the Food and Drug Administration (FDA) allowing food and beverage makers to use an untested and unapproved substance that could be hazardous to our health? The culprit here is a super-sweet industrial additive known as HFCS-90. It’s a strain of the highly controversial High Fructose Corn Syrup, but it has 90% fructose, almost twice the legal limit allowed for use in our foods and beverages. But the Corn Refiners Association (CRA), a lobbying group that represents the companies that manufacture HFCS-90, recently admitted that this banned ingredient has been in use “with FDA knowledge for decades.” In blatant violation of government regulations, one manufacturer, Archer Daniels Midland, even markets a non-FDA approved food product, Cornsweet 90® on its corporate website. Numerous clinical studies have shown that people who consume excess amounts of fructose are more likely to develop diabetes, heart disease and become obese. The FDA has only approved High Fructose Corn Syrup with no more than 55% fructose content. Yet a 2010 study found that samples of Coke, Pepsi and Sprite all had fructose levels much higher than the legally approved FDA limit. So why isn’t the FDA cracking down on these violators? Why isn’t our government protecting us and our families from this known hazardous food ingredient? Consumers must take action to stop this. Citizens for Health has filed a petition with the FDA to enforce the legally approved levels of HFCS fructose in our foods–and punish food makers that violate these regulations. The petition also demands that food and beverage labels include accurate HFCS fructose levels. We urge you to click here to add your name and comments to this important FDA petition. Exactly how much fructose does a can of Coke contain? My previous research indicated that both the U.S. Department of Agriculture and the Food and Drug Administration (FDA) know about HFCS 90 and its food uses. Numerous studies, patents (including a method for using HFCS 90 to produce a reduced-calorie beverage that was assigned to PepsiCo) and journal articles refer to it and all the different foods that can be sweetened with it. Given that the fructose content of HFCS is a topic the CRA would prefer not to discuss, it’s unlikely the organization would ever have made such an acknowledgment if not for a petition filed with the FDA this past September by Citizens For Health. The petition requests that the agency take action against food and beverage manufacturers using HFCS with fructose levels above 55 percent (the highest amount the FDA allows) and in the interim, require that actual percentage of fructose it contains be specified on the label. In responding to that petition, J. Patrick Mohan, interim president of the Corn Refiners Association, not only states that HFCS 90 has been used for “decades,” but also claims the “FDA acknowledged this in 1996 when it issued the HFCS GRAS (generally recognized as safe) affirmation regulation.” What Mr. Mohan neglects to mention, however, is in what context the FDA “acknowledged” HFCS 90 use. Mohan’s response also makes mention of “fluctuations in fructose levels above 42 or 55 %” in HFCS, which he apparently believes “would be expressly permitted” by regulatory officials. Those so-called “fluctuations” were ‘discovered’ in 2010 by Dr. Michael Goran, director of the Childhood Obesity Research Center (CORC) and professor of preventive medicine at the University of Southern California. Dr. Goren, who regards higher fructose intake as a risk factor in health problems such as diabetes (as do other experts), analyzed samples of Coke, Pepsi and Sprite, and found that fructose levels in the HFCS used in these popular beverages went as high as 65 percent. In fact, consumers have been given the impression that HFCS is even lower in fructose than that. In a TV ad blitz sponsored by the CRA, they were told that HFCS and sugar are basically the same, having “virtually” equal amounts of fructose and glucose. (Natural sugar, or sucrose, contains a fixed amount of 50 percent fructose and 50 percent glucose). One commercial – although it wasn’t produced by the CRA, but another group called “SweetScam.com” – even depicts HFCS as a psychiatric patient complaining to Dr. Ruth about having a name like “high fructose corn syrup” that was really “stupid…as I’m actually low in fructose” and being advised to change it to “corn sugar” (a recommendation that was flatly rejected by the FDA). But Mohan, must have missed all those commercials, judging from his letter to the FDA, which also states that “…there is no evidence that consumers have been ‘told’” about the fructose content of HFCS, and that “(I)nformation of that specificity simply does not appear on product labels or in the advertising or marketing of HFCS-containing, end-user products.” And while his letter claims that HFCS 90 uses are “minor” and that the “FDA has been aware of these limited uses for decades,” he provides no hints as to which food products may actually contain it or any idea of what “minor” and “limited” actually mean in this context. All of this leaves us with a question: how do we know the precise fructose content of food products containing HFCS? Is it 42 percent, 55 percent, 65 percent, 90 percent,or somewhere in between? And what, exactly, are those supposedly “limited” and “minor” items that the CRA now admits have contained the 90 percent fructose version of HFCS for all these years? These are things every American consumer should have a right to know. And by signing and supporting this Citizens for Health Petition to have HFCS fructose amount labeled, you’ll be making a statement that secrecy is impermissible when it comes to what we’re ingesting – and how much. Washington, D.C. – Citizens for Health has declared 4/11 National “Read Your Labels Day”. For one day (at least) we want you to investigate – and share – “the 411” on the importance of reading the labels on foods and beverages before you buy them. Observing the claims isn’t enough when a product can contain 10 times – or more – as much high fructose corn syrup than fruit juice, but make a big deal about being “made with real lemons”. Technically accurate, yes. Informative in any real sense of the word? No. Nor are the nutrition “facts” telling the whole story. Think of them as the main title of a movie. While they give you a very basic idea of what’s inside, you really don’t know the details until you see the end credits roll. —Check our list of the “Top Ten Additives to Avoid“ and learn why they made the list – courtesy of FoodIdentityTheft.com blogger and CFH contributor, Linda Bonvie. When you find any of these ingredients – or a favorite offender of your own – take a photo with your phone and share it with the world on Instagram, Facebook or Twitter using the hashtag #ReadYourLabels. —Visit the CFH Facebook page and share your personal pledge to avoid as many of these 10 ingredients as you can. It won’t be easy to avoid them all, since manufacturers do their best to disguise or distract you from the worst of them. But it’s worth it, and it’s a great exercise in staying informed about what you eat and feed to your families. —Sign the petition to label high fructose corn syrup (HFCS) – read more and sign here. —Get creative! Have an idea for how to mark the day, or how to share the “411” with other concerned consumers? Share it with us and other Citizens for Health through Twitter (#ReadYourLabels) or Facebook. We’ll be watching eagerly for what you share! Golfers Going Green Tournament – Proceeds Benefit CFH! It’s now officially Spring – even if your area hasn’t quite caught up yet. With Spring comes visions of picnics, BBQs and other time-tested outdoor activities…Like golf! Are you a budding pro? A duffer? Or perhaps you couldn’t tell the difference between an iron and a wood with both hands and a flashlight? It doesn’t matter! 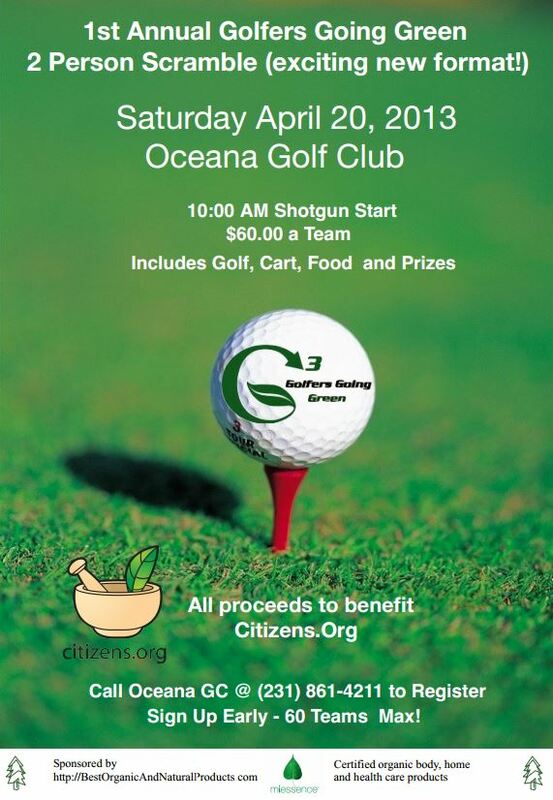 Mark your calendar for the Golfers Going Green two-person scramble, to be held Saturday, April 20, at Oceana Golf Club. It’s a 10 AM shotgun start and your $60 team registration includes golf, cart, food and prizes. Best of all: Proceeds will be donated to Citizens for Health! –Compete! The limit is 60 teams, so act now – you can register by calling the Club at (231) 861-4211. –Sponsor a tee sign! $100 gets you a professionally designed 24″x18″ full-color two-sided sign with your message. Advertise your business, an issue important to you, or say hi to friends or family. We hope this event will be an annual one, and those who sponsor signs this year will get a chance to do so again next year at half the cost. To sponsor a sign, contact organizer Jim Kueny at (231) 670-6211, or email him at golfersgoinggreen@gmail.com. Check out an example of a tee sign here. —Get a “tee”-shirt! Let people know you support issues of sustainability by sporting this special event tee for $22 – and remember, proceeds go to CFH. Order one here. Have it waiting for you at the event, or have it sent to you if you can’t attend. Buying a shirt also earns you a free golf cart voucher for your next 9 holes at Oceana! This is a truly “green” family event, fun and educational. Green event sponsors and vendors, recycled golf balls, issue-oriented signs throughout the course – event organizer Jim Kueny has pulled out all the stops to make this enjoyable for everyone. Easy and tough pin placements, great food and prizes – and all to support CFH’s efforts to preserve and expand your right to make informed decisions about what you feed to your families. Committed to spreading the word about nutrition and sustainable practices, Mr. Kueny has made it his life’s work to help people eat smart and stay healthy – so “naturally” he asked us to help him get the word out and chose CFH to be the beneficiary of his efforts. Help Jim help us – to help you! Share this with your friends who care about healthy food and urge them to get involved. If local, get them to register. If not, suggest they buy a t-shirt or sponsor a tee sign. And, of course, we hope to see you there. For further information or questions, please contact Jim Kueny at (231) 670-6211, or email him at golfersgoinggreen@gmail.com. And check out the event page on Facebook.